A Florida-based nurse who specializes in detox and mental health has released her memoir, which chronicles her journey through depression, anxiety and post-traumatic stress disorder after suffering mental and emotional abuse by her father, former husband and daughter, all of whom were addicted to alcohol. 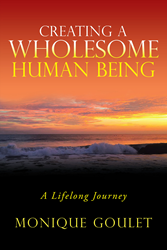 In “Creating a Wholesome Human Being,” Monique Goulet puts forth her unique healing modality for overcoming damaging life experiences. Goulet spent more than 25 years in therapy to heal from the abusive behaviors of several alcohol- and drug-addicted family members and losing her father and two brothers to suicide. Through therapeutic interventions, Reiki energy medicine and Shamanic healing, Goulet was able to establish coping skills to assist her in moving beyond her pain to find healing and peace. Now 80 years old, Goulet currently works as a registered nurse in a community health center’s detox and mental health units and hopes to reach out to those who have mental health issues or are recovering from alcohol or drug addiction as well as the loved ones of addicts through her story. A raw account of the destructive nature of addiction, “Creating a Wholesome Human Being” offers readers a glimpse into the process of healing and achieving spiritual growth in the wake of tragedy. Monique Goulet is a registered nurse specializing in addiction and mental health issues, a Shaman Healer and a Reiki Master. In her free time, Goulet enjoys traveling, yoga, walking, swimming, golfing, writing and facilitating self-empowerment, grief, inner child and trauma groups. She currently resides in Fort Pierce, Fla. To learn more, please visit http://www.claudettebetty.com.